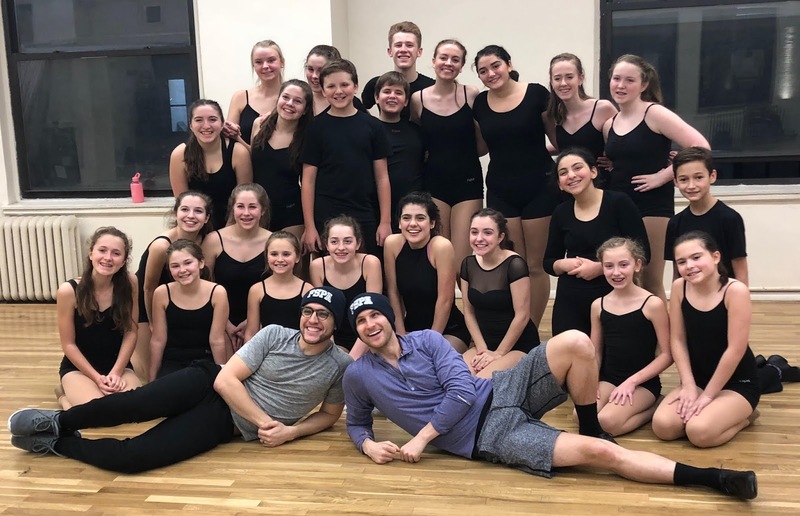 Over MLK Weekend, students from the Franklin School for the Performing Arts (FSPA) traveled to New York City to study with Broadway professionals. FSPA Musical Theater students of all ages took Song Interpretation, Monologue, and Theater Dance classes with Broadway stars, casting directors, and agents, while FSPA Dance students took classes at the world-renowned Broadway Dance Center. This trip has been an annual offering for FSPA students since 2008. The instructors for this year’s master class weekend included Tony Award nominees Jenn Colella (Come From Away, If/Then, Chaplin) and Alexander Gemignani (Carousel, Hamilton, Chicago, Violet, Sweeney Todd, etc. ), Broadway performers Darlesia Cearcy (Once on This Island, Shuffle Along, The Color Purple, The Book of Mormon, Ragtime), Christopher Rice (The Book of Mormon, Jack Kelly in Disney’s Newsies with the Franklin Performing Arts Company), Clay Thomson (Wicked, Disney’s Newsies, King Kong, Matilda), Tyler Haynes (Cats, Hairspray, Oklahoma, The Boy from Oz), Tyrick Wiltez Jones (Hairspray, Finian’s Rainbow), Andi Hopkins (Nat’l Tour of Dreamgirls), and NY Casting Director Bob Cline. The weekend concluded with a showcase for a panel of staff from Broadway Artists Alliance as well as agent Greg Uliasz. From this showcase, some FSPA students will be selected to return to NYC in February to study at the Broadway Artists Alliance Winter Workshop. The students also attended the Broadway show The Prom starring Tony Award winner, and frequent FSPA guest instructor, Beth Leavel. After the show, they were treated to a private question and answer session with Ms. Leavel. "I wish I had a Franklin School for the Performing Arts in my life when I was growing up,” says the Tony Award winner. “It's invaluable." In addition to classes and shows, a tradition of FSPA’s annual New York City weekend is a dinner with FSPA alumni living and working in New York City. FSPA currently has alumni working on Broadway, off-Broadway, in National Tours, on film, TV, professional opera, and regional theater across the country. For more information on programs at the Franklin School for the Performing Arts, visit www.fspaonline.com, call 508-528-8668, or stop by 38 Main Street in Franklin, MA. FSPA is currently offering an “All Access Pass” to new students which includes a free trial class as well as tickets to an upcoming performance. (Newsies, Wicked, Matilda, King Kong) and Christopher Rice (The Book of Mormon).